Good morning! I’m so excited! Even though we aren’t camping yet, I was able to cook over the fire this weekend! 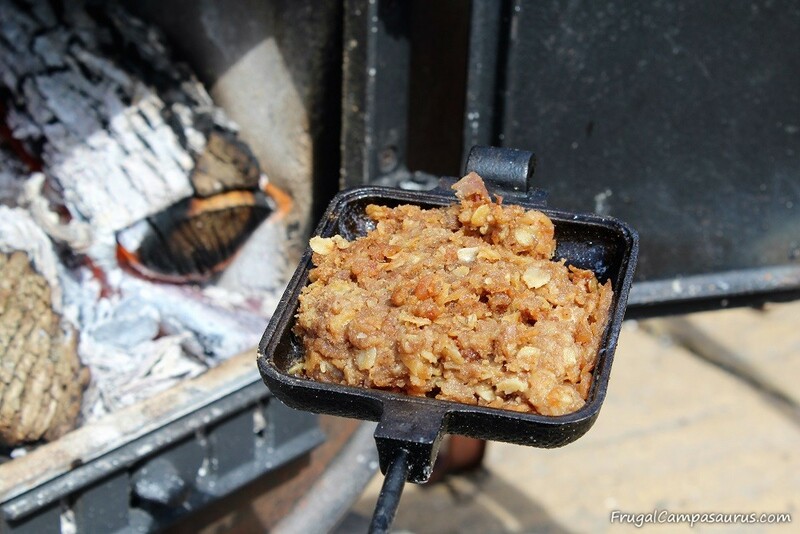 On our last day of boiling sap to make maple syrup for the season, I made a Pie Iron recipe-Leftover Apple Crisp Dessert! I was so happy to make a pie iron dessert. I love cooking over the fire when we camp, but the meals need to be easy. Low prep, simple recipes are the best for me. I don’t want to work in the kitchen for 2-3 days prepping food before we camp and I know I won’t do it while we are camping. I would rather be canoeing, hiking or just watching the campfire. My solution for easy camping meals is using freezer meals (like Dutch Oven meatballs) or Pie Iron recipes using leftovers. I like using leftovers from earlier in the week (or from the freezer) to greatly reduce food preparation time. 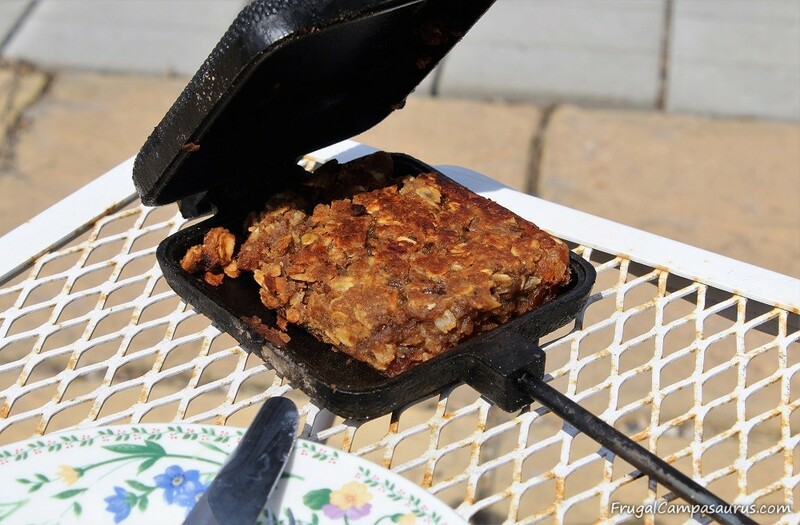 Cooking the leftovers in a pie iron can transform them into a whole new meal. 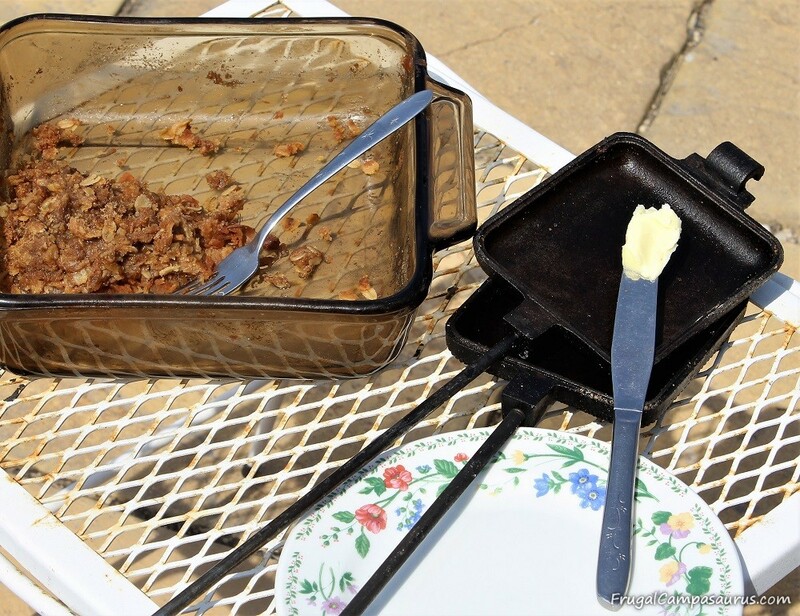 Leftover Coney Dog Pie Irons and Mock Lasagna Pie Irons are great camping meals, but I also wanted to try a leftover dessert pie iron. Usually, we don’t have leftover desserts. Cookies disappear quickly! But last week, I tried making apple crisp with shredded apples from the freezer. Since my family (evidently) prefers chunks of apples in their apple crisp, I had leftovers. With leftover apple crisp and a whole day of sap boiling ahead of me, it was the perfect time to experiment over the fire. The pie iron dessert was extremely easy to make! It had just two ingredients: leftover apple crisp and butter. 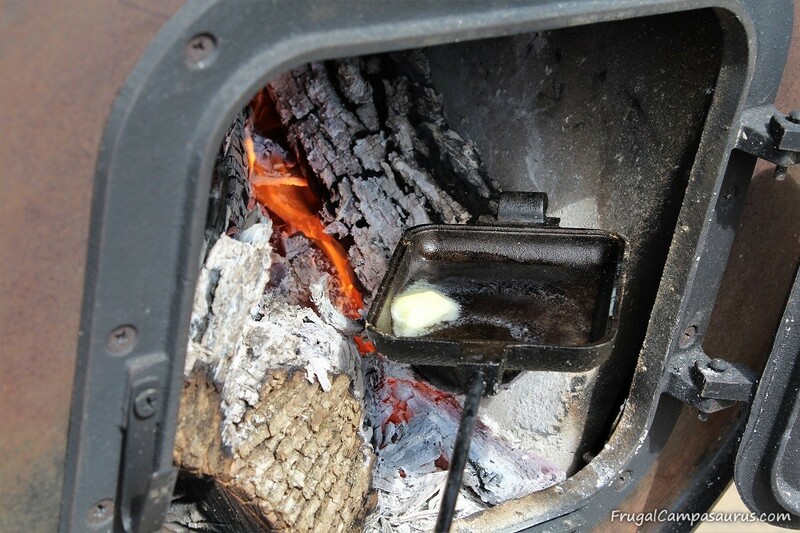 Melting butter for the pie iron dessert in front opening of my new maple syrup cooker! I melted about 1 teaspoon of butter in half of the pie iron. Then, I poured some of the melted butter into the other half of the pie iron. Tilting the pans helped spread the butter out, but I didn’t wipe the butter around evenly with a paper towel. The apple crisp already has lots of butter, so I figured it wouldn’t stick. And it didn’t! I spooned the leftover apple crisp into the pie iron and closed it. The apple crisp was deep enough to have good contact with the pie iron, but not enough to fill it all. That was ok, it was still a large enough serving to share with the husband. Cooking the pie iron dessert over the fire was fun! I had not cooked other foods with the new maple syrup cooker yet, just maple syrup. Since I had 2 pans of sap on top of the barrel, I cooked right in the door. The pie irons were a bit heavy, so I sat them right on the logs to cook. I did turn it often, so the apple crisp wouldn’t burn. I am glad we have cast iron pie irons, since I like to set them right in the flames. I have wrecked all our Teflon ones with the high heat. The cast iron ones are heavier, but more durable. 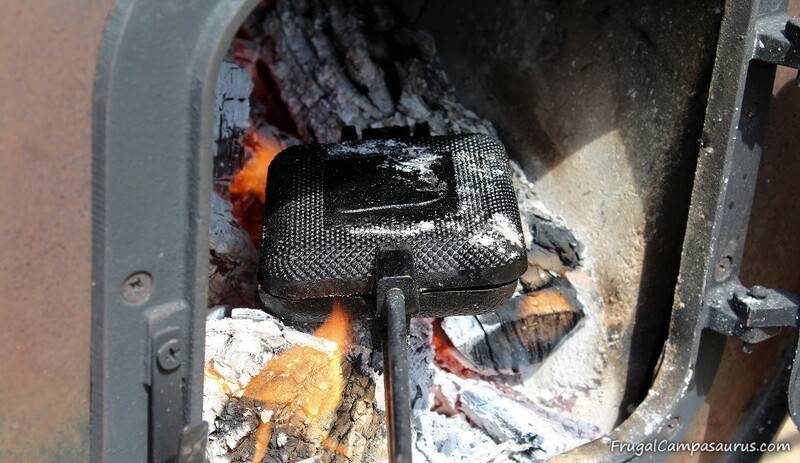 The weight is usually ok, because we rest them on the fire grate or the edge of the fire ring when we are camping. It worked fine resting them on the logs though, they cooked without burning. Leftover apple crisp with a golden, crispy outside sounded sooo good. I cooked them about 10 minutes. This is longer than I usually cook with a pie iron, but I wanted it crispy. While the crispy outside sounded good, it turned out to taste more fried. 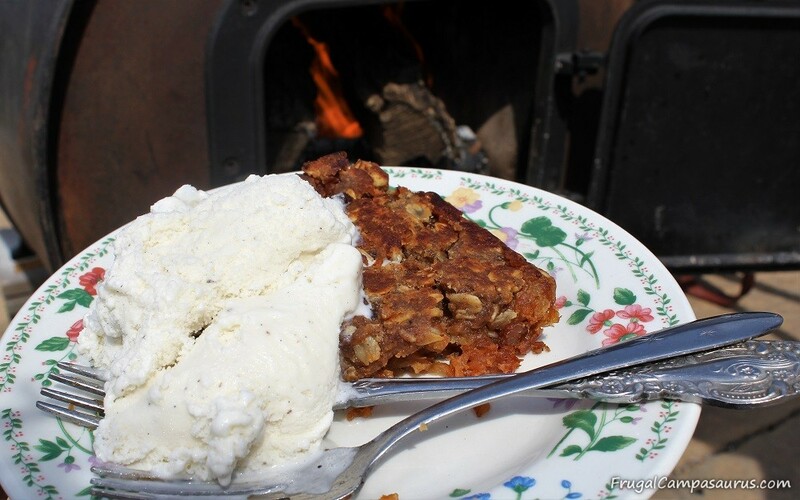 It was still good, especially with ice cream, but I would like to try it just warmed over the fire. I wish I had more leftover apple crisp or even rhubarb crisp, so I could try it again. I can’t wait for the camping season to start, but I’m glad I was able to cook over the maple syrup fire! 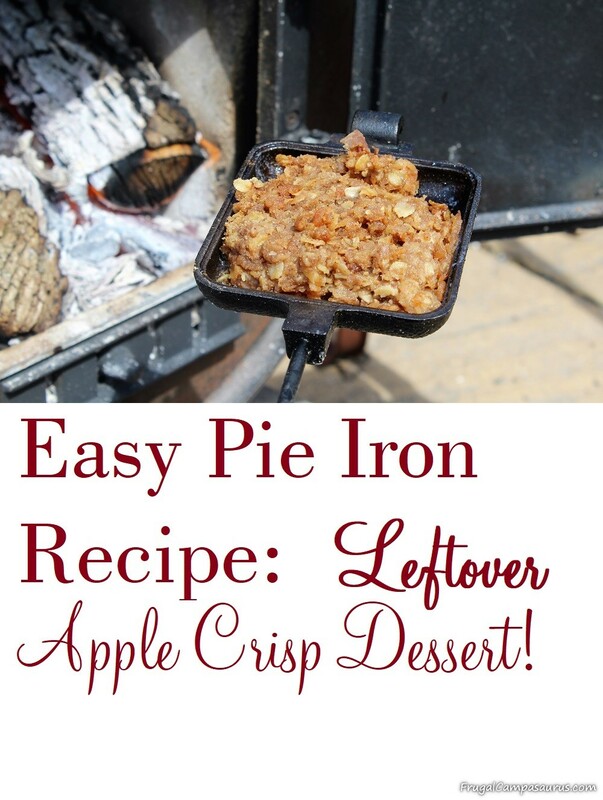 This summer, I hope to try more leftover pie iron recipes- maybe an apple crisp from scratch would be good in a pie ion!